Milwaukee skyline at twilight with city reflection in lake Michigan and harbor pier. No other major Midwestern city can claim a location where three rivers flow into a 22,000-square mile Great Lake. 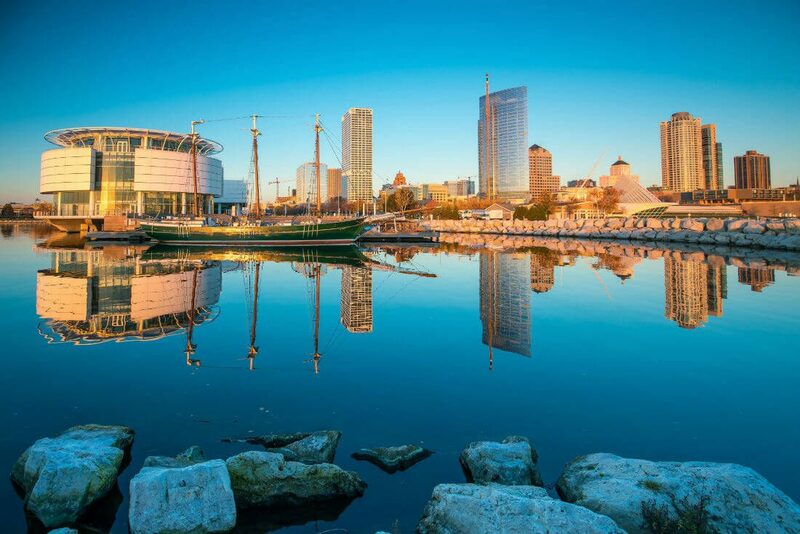 Located on the shores of Lake Michigan and at the confluence of the Milwaukee, Menomonee and Kinnickinnic Rivers, Milwaukee is filled with waterfront excitement. Explore Milwaukee’s rich architectural history, from the Gilded Age splendor of the Pabst Mansion to the stunning modern look of the Milwaukee Art Museum. Tour Miller Brewing Company and witness the brewing, bottling, and packing procedures. A walk through the Harley-Davidson Museum displays an unrivaled collection of Harley-Davidson motorcycles and memorabilia. Tour one of the country’s finest outdoor living history museums at Old World Wisconsin, with its extraordinary restorations of the homes, farm buildings, shops, churches, and schools of Wisconsin’s early immigrants.